What does your day to day involve as Events Co-ordinator? The purpose of my role is to co-ordinate commercial events on non-match days which can span anything from an exclusive dinner in the Twickenham Cellar for 14 people up to a 4 day long conference for 1,000 people which takes over the entire South Stand, these ones are my favourite! Once an event is contracted they come over to our team so that we can begin working with our client to bring it all together and make the event a reality. We will advise our clients on menus, agendas, logistics, room plans, suppliers, AV and production, health and safety and much more. We then need to make sure it is clearly communicated to our Operations Team who will be looking after everything on the day. It can be an extremely busy role at times but very rewarding when you see it all come together. 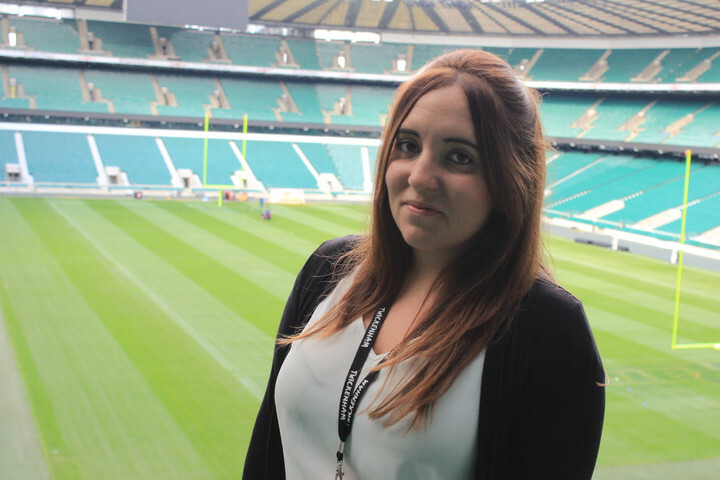 Tell us about one of the best events you've worked on at Twickenham… There have been many but I would say the one that stands out the most for me is an Ernst & Young event that we hosted last year. The event was for 1,200 people which is the most I have ever co-ordinated and involved a pitch side stage and light show in the stadium bowl with the Coldplay style light up wrist bands. Events that have really interesting menus always stand out for me as well. We recently designed a bespoke menu for a client which involved an edible garden, seeing all the guests interact and enjoy this on the day was fantastic. Are you seeing any trends from clients at the moment? I find that a lot of our clients are trying to introduce something a bit unique to their events at the moment which I completely understand. Everyone needs to make their event stand out from the others whether they are benchmarking against themselves and previous events or against their competitors. It keeps us on our toes and makes sure that we stay innovative with our ideas and preferred suppliers, we are always happy to do something a bit different. What is the strangest request you've had from a client? I have to say there have been quite a few during my time at Twickenham! I suppose the strangest but also one of my favourite requests has been for a zip wire across the pitch for a large conference. We couldn't quite accommodate this pitch side however we did make it happen on our concourse area and it went down really well as you can imagine. What's your favourite space at Twickenham Stadium? Without a doubt this would be the England Changing Room and Player's Tunnel. I cannot think of anywhere more exciting to host an event. After three years I still feel awestruck going into these spaces and just imagining what it is like on a match day. You can't beat that feeling of walking out of the tunnel and into the stadium bowl, it's amazing! The Member's Lounge is also a great space with its massive bar and amazing view, this room looks great for evening events when the lights are dimmed and the uplighters are on, it just has a great atmosphere about it.